Best Lenses for Sony A6400 mirrorless camera. Looking for recommended lenses for your Sony Alpha a6400? Here are the top rated Sony a6400 lenses. 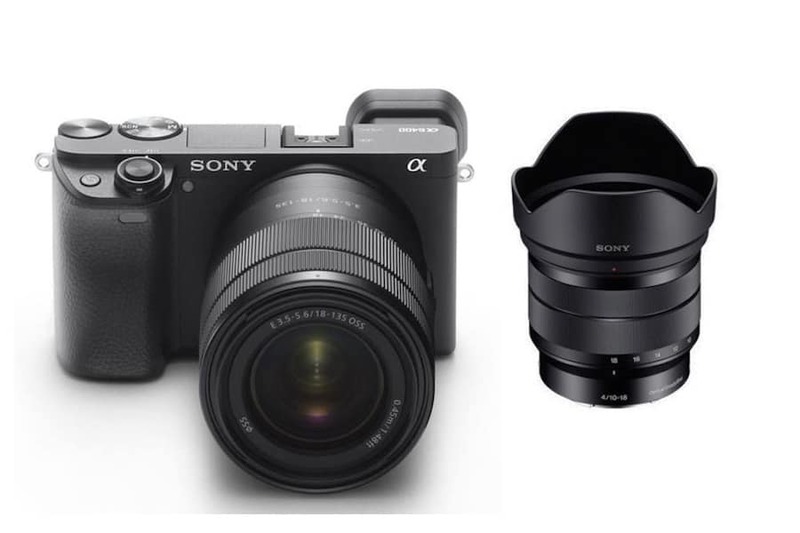 The Sony a6400 camera is the new mid-range APS-C E-mount mirrorless camera. The a6400’s specs revolve around a familiar 24.2MP APS-C Exmor CMOS image sensor, once again paired with an Bionz X image processor. Sony’s latest follows the last two camera generations by including a hot shoe mount and a microphone jack, as well as 4K video recording at 24 or 30 fps. The camera sports continuous shooting up to 11 fps using its mechanical shutter, or 8 fps in its silent shooting mode, with continuous AF / AE tracking. If you’re wondering about the math, that would be 116 frames of JPEG Standard or 46 frames of RAW compressed images. It is really amazing! So, in order to get a professional-like shot, the next thing is to find the best/right lenses for Sony a6400. Here we selected the best lenses for Sony A6400 camera. All the recommended lenses for Sony A6400 would cover virtually all shooting scenarios. Below are the top recommended lenses for Sony A6400 mirrorless camera. You can choose the one you need. Sony 18-200mm f/3.5-6.3 OSS LE ($848): A good all-rounder! From sweeping landscapes through portraits to sports and wildlife, Sony 18-200mm F/3.5-6.3 lens (35mm equivalent of 27-300mm)) will cover it all. It has fast focus and does capture sharp images and comes with OSS when natural light is low. It is extremely convenient. The perfect travel and walking around lens. Sony 50mm f/1.8 OSS ($298): This Sony 50mm lens offers a focal length (equivalent to 75mm on a 35mm camera) that is perfect for portraiture and a range of other subjects, a bright F1.8 maximum aperture, Optical SteadyShot (OSS) image stabilization and impressive image quality, all in a surprisingly compact and lightweight package. The Sony 50mm f/1.8 is sharp all the way to the corners, OSS and f/1.8 will make this lens a killer low light shooter! It is one of the best values of any Sony E-mount prime. Ideal for portraits, head shots and lowlight photography. Sony 35mm f/1.8 OSS ($448): This compact Sony 35mm f/1.8 OSS lens (35mm equivalent of 52.5mm) is a leading Sony E-mount lens and can be termed as the best lens in the market for lowlight photography with a maximum aperture of f/1.8 coupled with Sony’s OSS image stabilization. It is one of the Sony E-mount lens you must have. This Sony 35mm f/1.8 OSS is an ideal lens for portraits, low light, up close shots, videos and more. Sigma 60mm f/2.8 DN ($239): With a 90mm focal length equivalent in the 35mm format, this Sigma 60mm f/2.8 mid-range telephoto length lens is ideal for portraits. This lens focuses very quickly and it is very sharp. A maximum aperture of f/2.8 provides shallow depth of field and makes this lens effective in low light. A newly developed linear auto focus motor provides accurate ad quiet focusing which is ideal when shooting video. The only shortcoming is it doesn’t incorporate the image stabilization, but you won’t need it too often with a maximum aperture of f/2.8. Sony Zeiss FE 55mm f/1.8 Sonnar T* ($998): One of the sharpest lenses ever! Five Star! A large F1.8 maximum aperture can produce beautiful full-frame background bokeh. A bright lens like this is also an advantage when shooting indoors or outdoors in low light. Linear motor driven internal focusing is smooth and quiet, and a dust and moisture resistant design ensures consistently reliable performance. Sony FE 50mm f/1.8 ($248): The most affordable FE glass with great performance! A bright F1.8 maximum aperture, 7-blade circular aperture and aspherical element deliver impressive image quality with beautifully defocused background bokeh, all in a surprisingly compact and lightweight package. Sony FE 90mm f/2.8 Macro G OSS Lens ($1,098): Highly recommended! Optimized for macro shooting, the full-frame 90mm medium telephoto macro E-mount lens features built in image stabilization for sharp, clear images at up to 1:1 magnification, even when shooting handheld. Sharp in-focus rendering is achieved with a floating focus mechanism that suppresses aberration equally at all focusing distances, whether the subject is far away or extremely close. Finally, a handsome and sturdy build with a dust and moisture resistant design contributes to the overall quality and durability of this fine optic. Sony FE 50mm f/2.8 Macro Lens ($498): Ideal for everyday photography! Get close with this full-frame 50mm macro lens and wide F2.8 aperture and a 6.25” (0.16m) minimum focusing distance with a 1:1 macro capability. The optical and mechanical construction of the lens has less glare and ghosting, even without a lens hood. It can also be used on APS-C models where it provides a 75mm equivalent focal length. Sony 30mm f/3.5 Macro Lens ($253): The Sony 30mm f/3.5 Macro Lens has been designed to offer versatile, high-performance macro capabilities in a lens that is compact, lightweight and easy to use. It is a true 1:1 macro lens with a 3.84″ (9.5cm) minimum focussing distance that allows tiny subjects and details to be rendered with excellent resolution and contrast. But it also functions as an excellent “normal” lens for day-to-day shooting, and a smooth, quiet internal lens drive system makes it suitable for shooting movies as well. Sony FE 70-200mm f/4 G OSS ($1,498): The small size, versatile 35mm focal length, and outstanding overall performance of this lens make it an ideal match for compact 35mm full frame format E-mount bodies. This makes it useful for portraits and sports photography where you want to separate the subject from the background. It is as sharp as the f/2.8 version for less than half the cost, but not great when natural light is low. Sony FE 70-300mm f/4.5-5.6 G OSS ($1,198): Ideal for travel, landscape and wildlife photography, the Sony FE 70-300mm f/4.5-5.6 G OSS lens it has the longest reach of any FE lens to date. Having said that, the image quality leaves us wanting. Not great for low light and softness toward the edges. Sony 55-210mm f/4.5-6.3 OSS ($348): This Sony 55-210mm (35mm equivalent of 82.5-315mm) is the best telephoto option for Sony E-mount lens considering its price. The Sony 55-210mm lens offers a superb balance of form and function: ample zoom range in a compact design that is lightweight and remarkably comfortable to hold and operate. It’s lightweight and remarkably comfortable to hold and operate and it is perfect for sports or nature photography when you want to get up close from far away. Sony 10-18mm f/4 OSS Lens ($748): Highly recommended! Sony 10-18mm f/4 OSS (35mm equivalent of 15-27mm) is a top choice for wide angle zoom lenses as it is very sharp, focuses quickly, minimum distortion with a swift autofocus and it weighs only 7.9 ounces. In addition, it offers a constant maximum aperture of f/4 through the entire focal length range. It is one of the good choices for best Sony E-mount lenses available. Perfect for expansive landscapes, interiors and group shots. And great in lower light environments, such as outdoors at sunset. Sony Zeiss Vario-Tessar T* FE 16-35mm f/4 ZA OSS ($1,348): Excellent lens for landscape photography! For everyone from landscape professionals to those who want to just dabble in wide-angle photography, this Sony Zeiss FE 16-35mm f/4 is one of best FE-mount lenses: impressive sharpness, fast focusing, reasonable levels of distortion, and a weather-sealed build for protection from the elements. If you are going to step up to full frame, you can choose this one! Zeiss Touit 12mm f/2.8 Lens ($999): A beautifully crafted, manual-focus wide-angle prime lens. With an angle of view of 99 degrees, fantastic imaging performance, excellent sharpness & low light performanc and light weight, the Zeiss Touit 12mm f/2.8 lens (35mm equivalent of 18mm) is one of the very first choices for wide angle photographers & enthusiasts, particularly for landscapes and architectural photography. Sharp and faster than the Sony 10-18mm. Sigma 19mm f/2.8 DN Lens ($199): A great value! Lightweight, sharp & focus quickly, Sigma 19mm f/2.8 (35mm equivalent of 28.5mm) is a great wide-angle prime lens for Sony E-mount cameras. Maximum aperture of f/2.8 is effective in low light situations and able to create lovely shallow depth of field images. And it is $150 cheaper than the Sony 20mm f/2.8. Zeiss Batis 18mm f/2.8 ($1,499): Excellent FE-mount lens with incredible sharpness and color rendition. Well-suited to interior, architectural, and astrophotography applications, the Batis 18mm f/2.8 blends its extremely wide 99° angle of view with a high degree of functionality and it is extremely sharp all the way to the corners. Consistently excellent image quality right into the corners makes the lens perfect for the challenges of, for example, landscape, astro and architectural photography. If you are going to step up to full frame, you can choose this one! Rokinon 14mm f/2.8 ED AS IF UMC Lens ($268): If you love manual focus wide-angle lens, you can try the Rokinon 14mm f/2.8 lens with a considerably cheaper price. Sony Vario-Tessar T* E 16-70mm f/4 ZA OSS ($998): Highly recommended! This Sony 16-70mm f/4 lens (equivalent to 24-105mm in the 35mm format) can provide superb image quality from landscape to portraits and it is a wonderful travel option. The latest advances in optical design technology have made it possible to deliver prized Carl Zeiss contrast and clarity in a high-performance mid-range zoom. If you are looking for an excellent standard zoom lens, this is the right one you need. The only downside of this lens is its price ($998, the same price as the Sony A6300). If you can’t afford it and the Sony 18-105mm f/4 OSS will be the budget option for you, which has a longer range and half price, but not so that good optical performance. Sony E PZ 18-105mm f/4 G OSS ($598): Cheaper than the Sony Zeiss 16-70mm zoom above, and with more reach, this power Sony 18-105mm f/4 OSS (35mm equivalent of 27-158mm) zoom lens is a worthy alternative at a lower price point. This lens is a very good value for anybody doing both videos and stills. The power zoom is very silent and smooth for videos and the stabilization is very good. For stills, the lens is very sharp from around f5.6 to f8 but a little bit soft wide open. It produces very good images. And it is the #1 best seller in Mirrorless Camera Lenses Catogry at Amazon US. Sony 16-50mm f/3.5-5.6 OSS ($348): This compact Sony 16-50mm lens (35mm equivalent of 24-75mm) covers shooting lengths from true wide angle to standard portrait length and it is perfect for everyday walking around, portraits and vacations. Although the f/3.5 limits your ability to shoot in low light, This Sony E 16-50mm lens is a nice, affordable option if you are on a budget.